The true scale of fly-tipping on private land is not clear but it is estimated the fly-tipping on private land costs £50m to £150 million to clear up each year. Land managers, occupiers or owners of private property are responsible for clearing and disposing of any fly-tipping found on private land. Whilst the Local Councils will not clear waste dumped on private land free of charge, they may investigate such incidents where appropriate. In the event that a successful prosecution is brought, the Council can apply for the Court to order that the landowner’s clean-up costs be reimbursed. The Environment Agency will investigate major incidents with a greater potential to cause harm to human health and damage to the environment, such as the larger scale incidents of fly-tipping (generally those involving more than a lorry/tipper load of waste), incidents involving hazardous waste, and those involving organised gangs of fly-tippers. By taking this approach it allows the system to reflect the needs of the community it is serving. Working with others including your neighbours, local businesses and any existing partnerships. Regardless of whether land is public or private, if you find fly-tipped waste you should report it to the relevant authority. 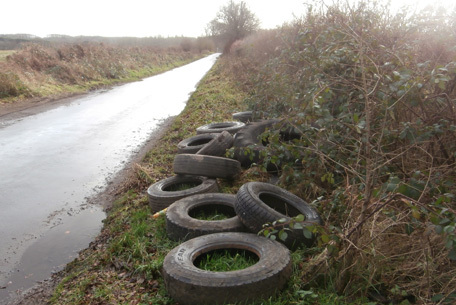 Fly-tipping prevention advice for landowners.